At least 30 people have died and rescue efforts are continuing following a landslide at a landfill site in Sri Lanka, which destroyed nearly 80 homes – the second major landfill disaster in as many months after over 115 people were killed in a landslide in Ethiopia last month. 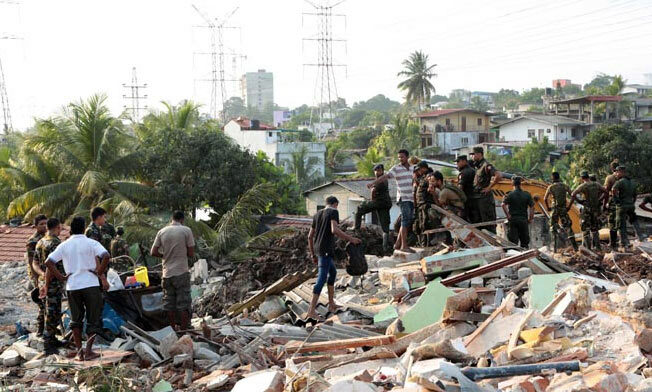 Sri Lankan armed forces have assisted in rescue operations at the Meethotamulla site. The collapse occurred while the Sinhala and Tamil peoples, who make up the majority of Sri Lanka’s population, celebrated their new year on Friday (14 April). The 91-metre-high pile of rubbish at Meethotamulla dump collapsed after a fire broke out at around 2.30pm, near the top of the pile. Officials say that the section that collapsed measured around 13,500 square metres. The latest data from the country’s Ministry of Disaster Management reports the death toll has risen to 30 individuals, including women and children. Some local residents have estimated up to 100 people could be buried in the rubble. More than 600 people have fled their homes, while the government has provided temporary shelters at three nearby rice paddy warehouses, offering basic amenities including water and sanitary facilities. The landfill site is situated in Kolonnawa, on the north-eastern edge of the country’s capital city Colombo. Approximately 800 tonnes of solid waste is added to the site daily. Local residents have previously demanded that the government remove the dump, citing health problems as well as concerns about landslides, with the government stating plans to remove it under a new infrastructure strategy. Following the landslide, the country’s Prime Minister, Ranil Wickremesinghe stated on Saturday (15 April) that the government would remove the dump from the area as soon as possible. More than a thousand security forces personnel have been involved in the clearing operations, including the Army, Navy Air Force, Special Task Force and police as well as the Ministry of Disaster Management. 15 earth-moving machines and 15 dump trucks have been utilised to move the operation along, as some parts of the site are buried in 30 to 40 feet of rubbish. The Sri Lankan police are currently investigating whether the cause of the landslide was natural or manmade. State officials and security forces have launched a preliminary assessment project to assess the full extent of the damage and potential future threat. This landfill disaster is the second in as many months, following a landslide at the Koshe dumpsite on the outskirts of Addis Ababa that killed at least 115 people in March. The 360,000 square metre landfill has been in use for more than 50 years and hundreds of informal workers spend every day scavenging for useful items on the landfill, with many living in makeshift homes on the edge of the site. Last September, the International Solid Waste Association (ISWA) produced a report suggesting that more than 750 deaths related to poor waste management and dumpsites were recorded around the world in seven months in 2016, the result of around 40 per cent of the world’s waste ending up in open dumpsites. The organisation, which works to promote and develop sustainable waste management, has called for the world’s biggest dumpsites to be closed, calling them a ‘global health emergency’. Commenting after the latest tragedy, ISWA President Antonis Mavropoulos said: "Enough is enough. The world counts a death toll of 143 people in just one month. As long as there is no global response for the closure of dumpsites, the death toll will keep rising with more than three casualties per day, without counting the long-term health impacts and the chronic diseases involved. "Dumpsites are becoming a lethal health emergency, and we can’t just expect the next landslide or biogas explosion, we can’t just wait when the poor countries will find the resources required to manage the problem. ISWA calls for an urgent global response that will drive the closure of the world’s most risky dumpsites and improve the lives of 64 million people that are under risk." ISWA has launched a new website, closedumpsites.iswa.org, to provide examples of how to close dumpsites in a sustainable manner and offer support and help to countries and cities looking to do so. At least 115 people have been killed by a landslide at a landfill site in the Ethiopian capital Addis Ababa, with dozens more still missing. ISWA has published a roadmap for closing the world’s biggest dumpsites, a ‘global health emergency’ accounting for around 40 per cent of the world’s waste and presenting severe health risks to the four billion people that use them. A new report from the International Solid Waste Association says that open dumpsites are harming the lives of tens of millions in the developing world. With three billion people in the world lacking access to decent waste management services, WasteAid UK is sharing skills so communities can tackle the waste crisis themselves. The designer of a mobile recycling facility says that governments and NGOs must seek practical solutions to sanitation in refugee camps, with the number of displaced people around the world at record levels. Recycling charity WasteAid is set to establish a new recycling centre in Kenya after being awarded a grant from UK Aid Direct, the government fund for projects working towards poverty reduction.